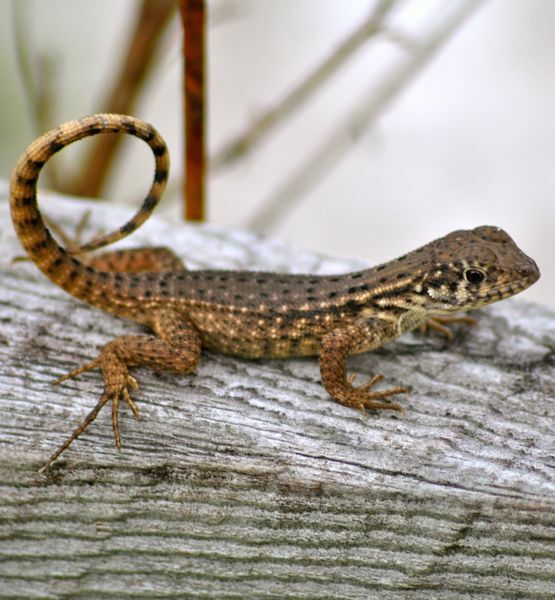 Curly-tailed lizard, photographed at the Loxahatchee National Wildlife Refuge, Boynton Beach, Palm Beach County, in November 2015. It really doesn't take much imagination to figure out how this little invader from the Bahamas, scientifically known as Leiocephalus carinatus, got its name. But to call the northern curlly-tailed lizard an Invader really is a bit of a misnomer. It's more like an invited guest that's overstayed its welcome. 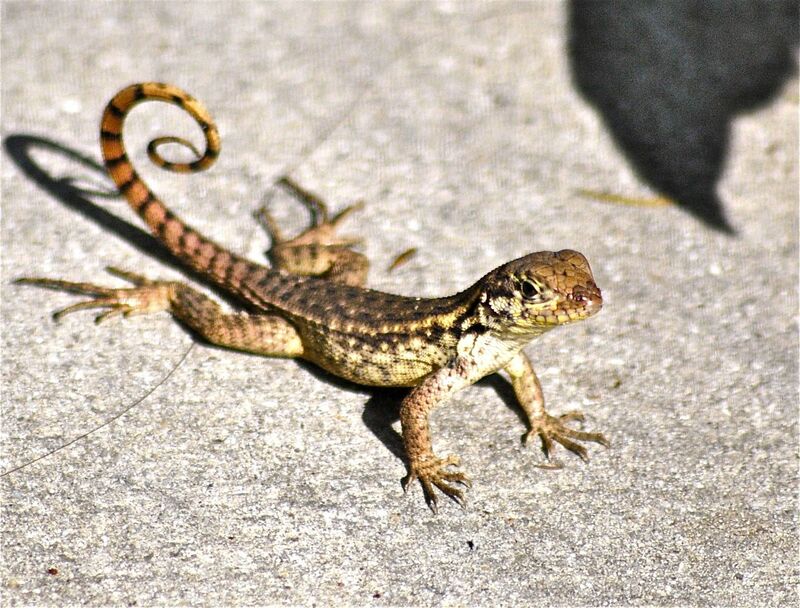 In the 80-plus years since it first came to South Florida, it's become probably the second most common exotic lizard in the region, behind only the seemingly ubiquitous brown anole. We've seen it called an invasive species, but we haven't seen it officially designated as such. The definition of an invasive is a plant or animal that is damaging ecosystems or displacing native species. The Florida Fish and Wildlife Conservation Commission says it doesn't know what, if any, effect the curly-tailed might be having on other species in the Sunshine State. The most obvious candidate for harm is the green anole, but it's already been forced out of its normal habitat by the more aggressive and non-native brown anole. Curly-tailed frequently eat brown anoles, but as we noted, browns are non-natives anyway. One theory poses that the presence of curly-taileds are forcing browns to be more arboreal, thereby forcing native greens higher into the canopy. Curly-taileds hail from the Bahamas, some say Cuba as well. An adult can reach 11 inches in length but most go about seven inches. They are a mix of grays and browns, much stouter-looking, with a much larger head, than the brown anole. And of course, there's the telltale curly tail. Curly-taileds are good climbers, but they're mostly ground-loving animals. In the Bahamas, they live in dry, sandy areas under coral rocks or logs. In Florida, concrete substitutes for coral rock. They're more likely to be found in urban areas near the coast, but they can be found well inland and in the wild. They eat bugs and lizards but also flowers, particularly railroad vine. Mating season is spring, with females laying eggs in summer. The curly-tailed curls its tail for several reasons, including territorial display, courtship and as a response to predators, the idea being to trick the attacker into thinking the tail is the head. The tail is detachable. As we said above, curly-taileds were invited guests, having been brought here both as pets and as a way of controlling the insect population. They're presence in wilds of Florida was first noted in 1935, having been spotted in Dade County, according to the FWC. In the 1940s, sugar cane growers released curly-taileds into their fields to control insect pests. Florida Atlantic University Professor Jon Moore, however, says 20 pairs of lizards were released on Palm Beach Island, where not much sugar cane is grown. The Bahamas National Trust tells the same story but adds that the lizards had spread only 20 blocks from where they were originally released within their first 20 years; by 1968, however, they had made to the mainland. 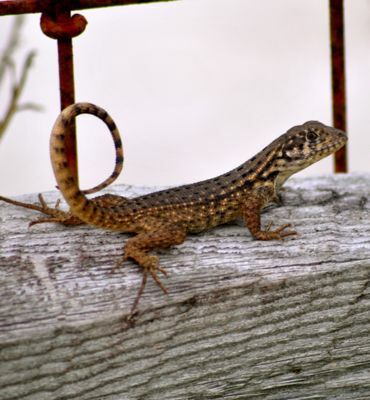 Either way, Palm Beach County became the center of the curly-tailed population. Curly-taileds have taken up residence in at least 10 counties, and their range is growing. The core sits between Hobe Sound in Martin County and Lighthouse Point in Broward. According to BNT, there are five species and nine subspecies of curly-tailed in the Bahamas, but only one species, L. carinatus lives in Florida. All curly-taileds are members of Leiocephalidae.